I wasn’t planning to order a Trunk from Trunk Club. Really, I wasn’t. And then I saw Mary Poppins Returns with my friend and basically drooled over Mary’s outfits the entire movie. Then, the very next day I got an email from Trunk Club asking if I’d like a Mary Poppins Returns inspired Trunk. Um… YES! TAKE ALL MY MONEY! The Trunk came a few days later and it was an unfortunate mess of unflattering pieces that highlighted all my wobbly bits and none of my good bits. So, instead of subjecting myself to photographing anything and blogging about it, I just stuck it all back in the box and arranged for a pick up the very next day. Until a couple weeks later when my new stylist (my previous stylist left the company, so now I have been assigned to a stylist named Amelia), sent over a Trunk preview for me to check out. A couple of the pieces showed promise, so I declined all the items I knew I didn’t want to try and made sure to give my stylist feedback on why I removed each one. After reviewing my notes, Amelia added in a few more things to fill out the Trunk and sent it over to me. So, was it practically perfect in every way… or was it just a bunch of pish-posh? Let’s take a look! 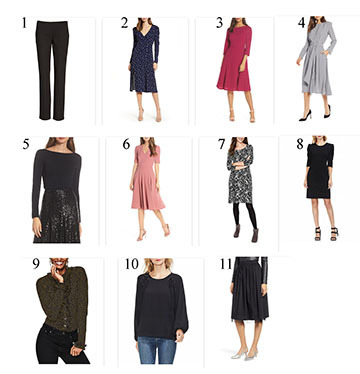 (1) Eileen Fisher Slim Ponte Knit Pants, $208, (2) Madison & Berkeley Midi Dress, $59, (3) Eliza J Fit & Flare Dress, $148, (4) Something Navy Midi Dress, $99, (5) Eliza J Bow Back Sweater, $98, (6) Girl Meets Glam Edith Midi Dress, $178, (7) Boden Winifred Pattern Dress, $140, (8) Vince Camuto Puff Shoulder Dress, $119, (9) Boden Alberta Ruffle Shirt, $70, (10) Vince Camuto Tie Blouse, $99 (no link), (11) 1901 Full Skirt, $89. If you’re new to my Trunk Club reveals (you can find them all here), I don’t typically photograph every single one of the items. When the Trunk first arrives, I usually go through it and narrow down my choices to a pile of my favorites. (2) Madison & Berkeley Midi Dress – the fit on this one was SO ODD I couldn’t get the shoulders on! 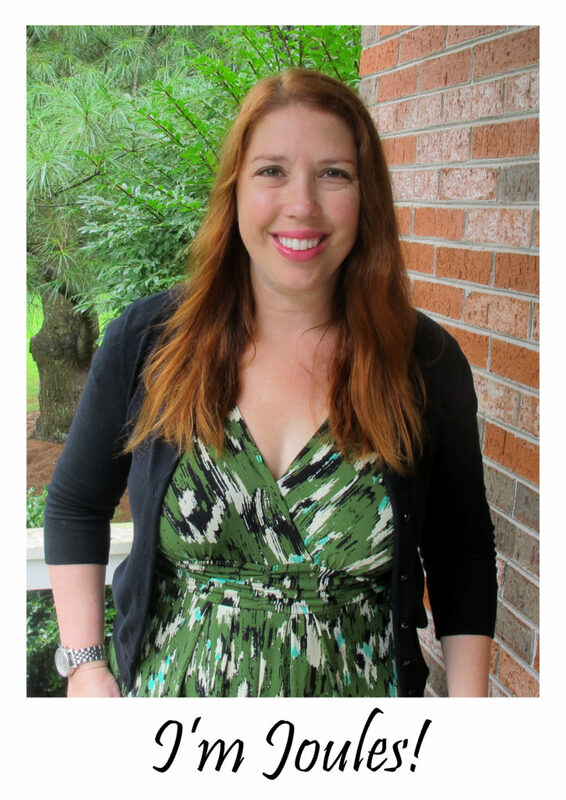 (3) Eliza J Fit & Flare Dress – Too high on my neck and it was strangling me. 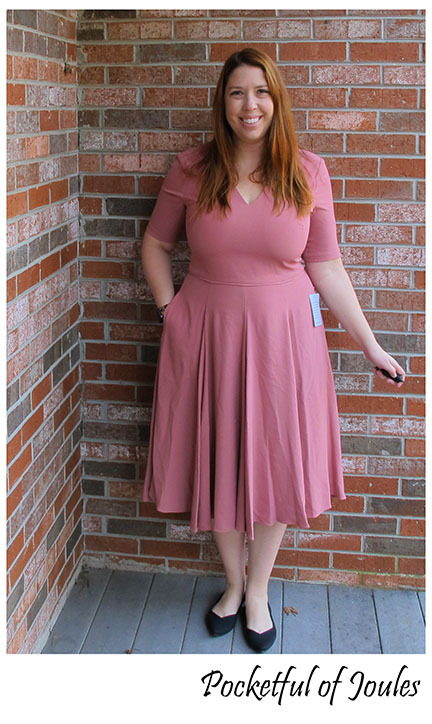 (4) Something Navy Midi Dress – Super frumpy and a bunch of NOPE. (5) Eliza J Bow Back Sweater – Why is this a crop top?! Is this SUPPOSED to be a crop top?? (7) Boden Winifred Pattern Dress – Cute and AMAZING fabric, but highlights my mommy tummy. (8) Vince Camuto Puff Shoulder Dress – 1980’s Awful. (10) Vince Camuto Tie Blouse – The laced shoulders are really wierd. Initially, I wasn’t sure if I loved this shirt or if I hated it. It’s Boden, so the jersey is wonderfully soft and the fit seems good. I get the cool ruffle down the front, but the ruffles on the cuffs are a bit…um, too ruffle-y? 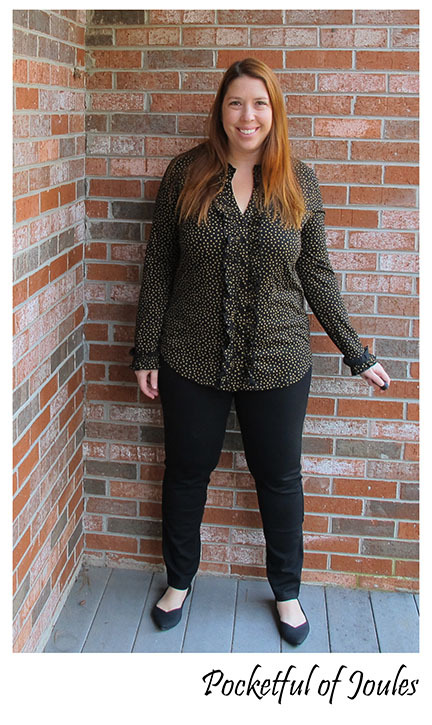 I first tried the blouse with the Eileen Fisher pants. I have a couple pairs of pants form Eileen Fisher and they are wonderful. This pair is a bit of a different material and would need to be hemmed an inch or so if I were keeping them. As it is, they aren’t really wowing me and I already have a pair of black work slacks that I love. I switched the pants out with this skirt from 1901 (a new Nordstrom brand of classics with a twist). I think by combining the top with a skirt, it helps keep the ruffles from overwhelming me. However, this skirt in particular is not a winner. The cotton outer layer is rather thin (and wrinkly) and feels cheap. I like the cool crinoline slip detail and the pockets, but the fit is a bit off and it’s making me look dumpy. 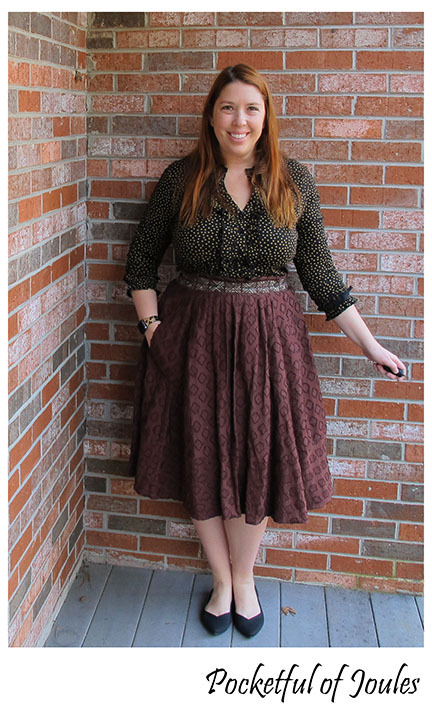 I felt like we were on the right track by pairing the Boden blouse with a full skirt, so I decided to try it with one that I already own (from Anthropologie a few years ago). I wish I had a solid black one, but this burgundy version with the gold accent embroidery actually looks kind of snazzy with the blouse. I also tugged the sleeves up a bit so that the ruffles weren’t flopping over my hands and it made a world of difference. NOW the blouse is a contender! What do you think, should I buy it or send it back? When I saw the preview of this Trunk, this dress was the one that I was most excited to try on. I love a good v-neck combined with a fit-and-flare cut. The fabric on this dress is also a bit fancy, so it would be great for a dressy work day with a blazer. 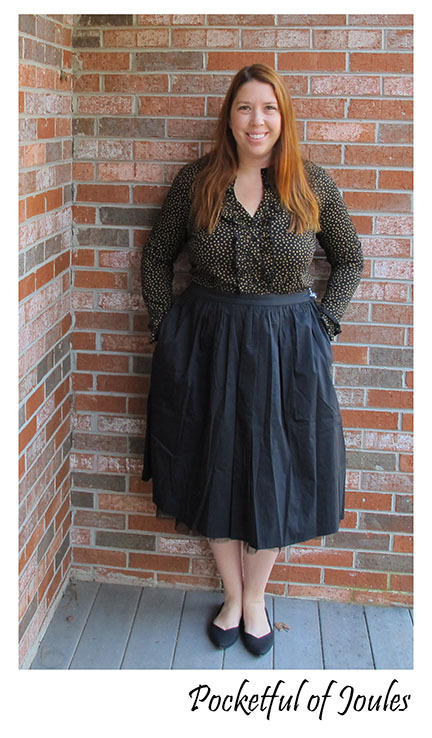 The skirt is extra full and swingy and has those all-important pockets. The sleeves are also a great length to hide my tattoos. The only problem is… it’s pink. I’m not really a pink person. Also, the bust is a smidge tight. So, sent a quick message to my stylist and apparently Trunk Club also has it available in navy and additional sizes! I’m thinking navy would look so much better with my hair color and I could add a fun pop of color with my shoes or even a cardigan. What do you think, should I exchange this one for the navy version and try two different sizes? Okay, so if you’ve been playing along that leaves me with just two favorites from this Trunk: the Girl Meets Glam Edith dress (but in Navy) for $178 and the Boden Alberta Ruffle Shirt for $70. I posted both items on my Instagram stories over the weekend to get some feedback. For the shirt, the voting was 47% said to buy it and 53% said to pass. For the dress, the split was 53% buy and 47% pass. So, now I’m even more confused… should I just send everything back? I’d love to know what you think! Leave me a comment below! 1/15/19 Update – The People Have Spoken. Thank you all for your comments! I sent back the whole Trunk without buying anything. Once it gets to them, Amelia will send me the Girl Meets Glam Edith dress in Navy (in two sizes). I’ll keep you posted! You have some great outfits and great style. I don’t think these outfits are up to your standard. No as flattering as what you usually choose. Thanks for sharing! You should totally try that dress in navy. It looks great on you, and I think the blouse would be cute with a black skirt. I would say, try the dress in navy, it would look pretty with a jacket, too. The blouse just doesn’t seem worth $70. Not up to your standards, as Jane put it. Thanks Nancy for your feedback!! I’m in agreement with the others…the dress in navy could work, but I’m not loving the other items. I like the Boden shirt on you. I also like the pink dress but definitely not a fan of the color. I hope you try it in the navy because the fit looks great. Agreed you should send the blue skirt back – way too much material. Lol, can’t go wrong with classic Anthropologie! I’ll have to do a mini post when the navy dress arrives.